I know i’m going to come off like a crochety word nazi, but i don’t care. I demand a total and immediate moratorium on awesome. The a-word has been the most tenacious meme ever to infest the English language. Like some kind of evil invasive species, it has strangled out every native adjective. Ad-copy writers (oops i mean content providers) shove it into every slogan and tagline. CBC announcers and politicians hiccup it like some kind of chipper Tourette tic. It is everywhere, and it is boring. Back in the day, the word carried real gravity, and was reserved for seriously gobsmacking stuff. Stuff that evoked aweâ€”like Niagara Falls, or the wrath of God. In the post-awe age the concept was polluted by irony and adopted by adolescents. 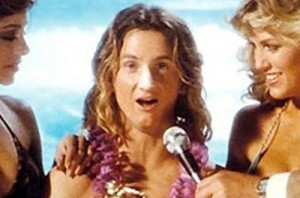 It entered pop parlance in the early ’80’s as a signifier of dumbass surf cultureâ€”think Spicoli in Fast Times at Ridgemont High. It spread like herpes. Your mom picked it up, which was kind of embarassing and maybe a little bit cute. It stopped being cute about ten years back, when your grandma started saying it. She still thinks it’s hip. It isn’t. Outstanding! Excellent! Exemplary! Rapturous. Groovy. Dope. Rad. Superlative itself, as a superlative. Anything, please, anything but the a-word. To clutter your speech with this tired superlative is lazy, unoriginal, and worst of all: old. The a-word has been polluting the language for more than 30 years, and it is done. So done. Dude. I kinda agree and I checked and came up with ‘ to inspire with reverential wonder combined with latent fear 1753’ Now doesn’t that say something about our modern celebrity obsessed culture with its insecurity and fear of failure. I agree that it’s a replacement for ‘fear of God ‘ from a earlier religious time.